Nordica Warehouses, Inc. will arrange LTL and Truckload shipping of your product — Locally, Nationally or Internationally. 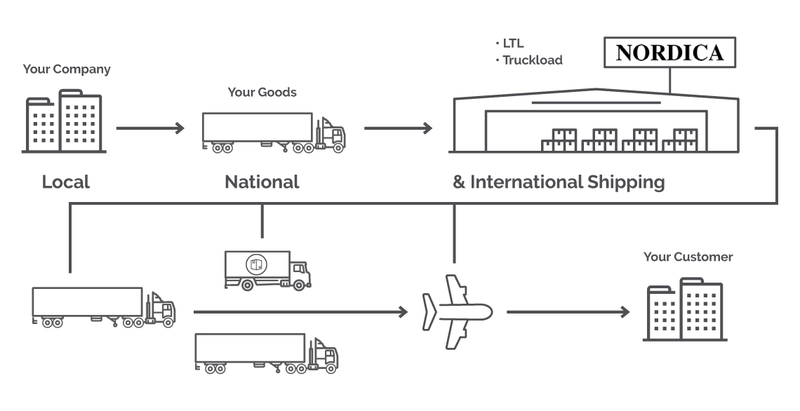 Nordica can arrange the shipping necessary for your pick up or delivery of all your intrastate products. Our extensive shipping experience can handle any kind of load. We also partner with local dry and refrigerated carriers for easy transportation of your goods to and from our warehouses. Our warehouses are conveniently located in Sioux Falls, SD, near the junction of Interstates 90 and 29, which means expeditious shipping of your product to any area in the Continental US. We make global shipping and receiving easy. Nordica will load and unload containers and assist in document preparation. We can prepare your products for international/overseas shipping. Our freezer is inspected and certified for storage for storage of products going to the European Union. In addition, Nordica Warehouses is a bonded Foreign Trade Zone with a port of entry office in Sioux Falls for clearing inbound foreign shipments. At Nordica, we are always looking for ways to help you meet your needs and critical deadlines. We have the capability of comparing delivery prices and turnaround times with various package delivery companies and the U.S. Postal Service to ensure you have the best possible shipping option available. Learn more about our additional services: Dry, Air Conditioned, Cooler/Freezer.